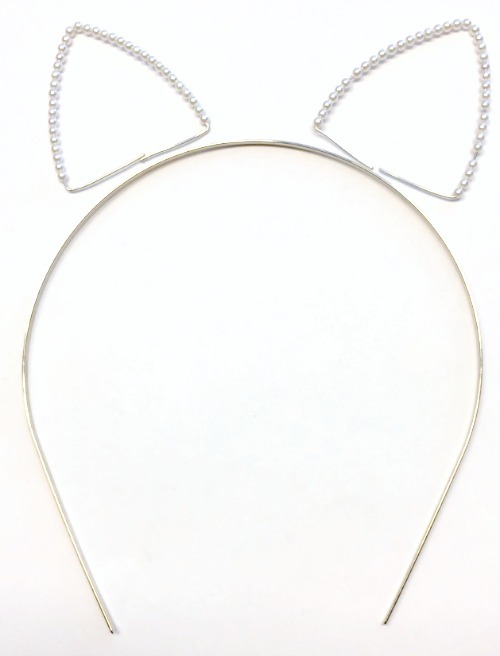 We love these Cat Ear Headband. We think they are Purrrfect! 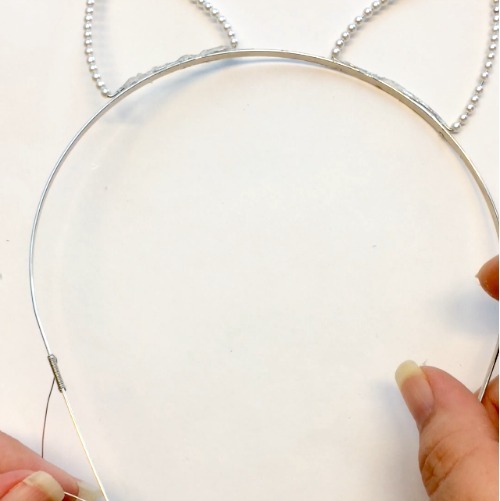 Come learn as Jamie Estelle of Jamie Estelle Jewelry takes you through the steps of designing your very own Cat Ear Headband. Make sure your metal headband is clean. Use a cotton ball and clean it with rubbing alcohol. To make sure its free of dust and oils. It will also help the glue stick evenly. Cut a piece of 20 gauge wire, about 10 inches per cat ear. 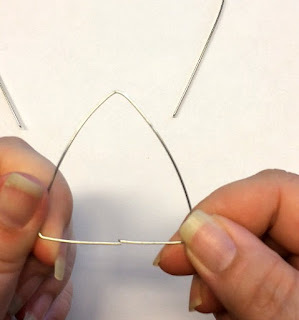 Bend the wire to form a cat ear, like a triangle shape. 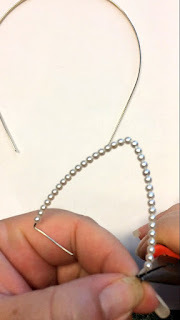 Clip the wires with the wire cutters to make them even. Make two of them. 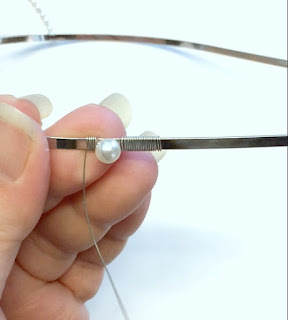 Bend one side of the wire and start putting on your smaller 2-3mm white glass pearls. 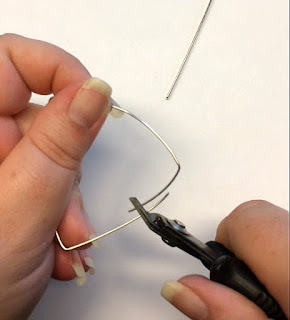 Fill up the one side and bend back the wire to the original placement. Repeat on the other side. 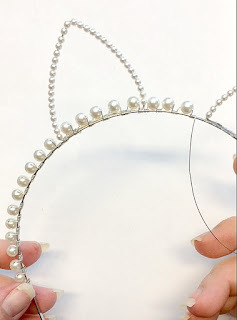 Your cat ears should look like the pictures below when finished. 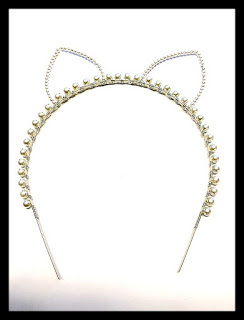 Now with a toothpick take a small amount of glue, put it on the headband in the place wear you would like your cat ears. Place the cat ears in the glue and let it dry for about 2 hours. Note: You do not have to use glue. 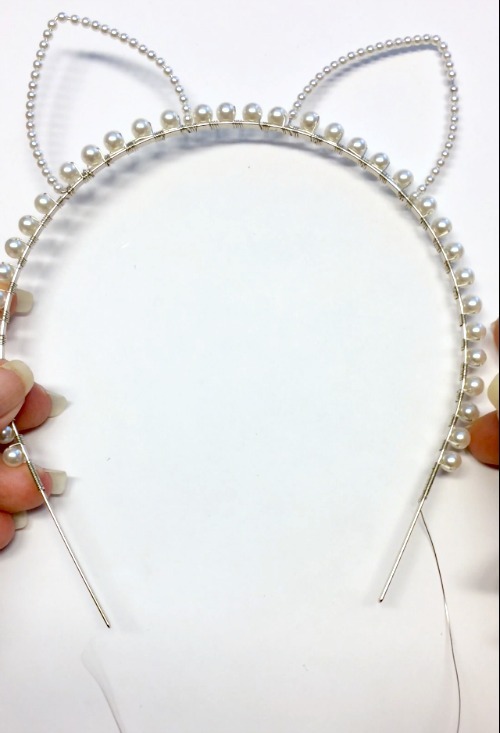 I like to use it to secure the ears while I wire wrap them to the headband. 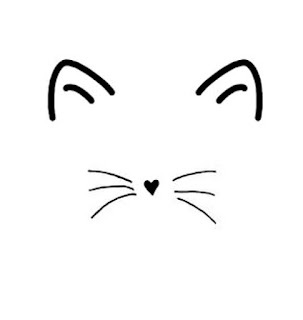 It helps them stay in place and not twist or unshapen the ears. 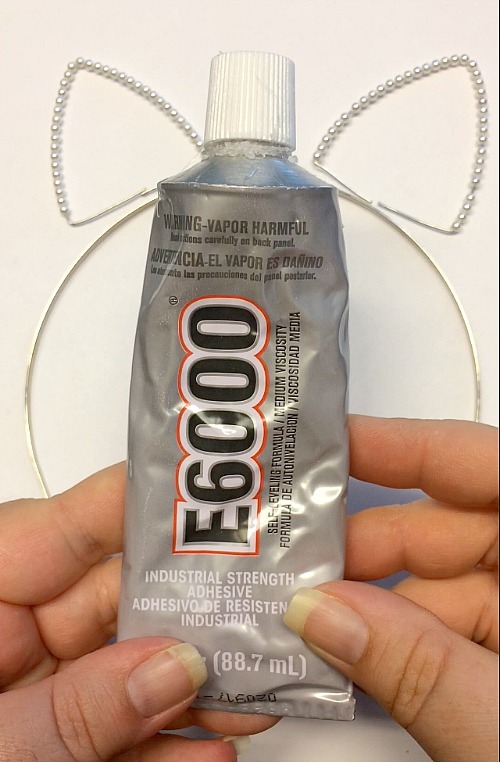 If you feel confident using no glue, then go for it! 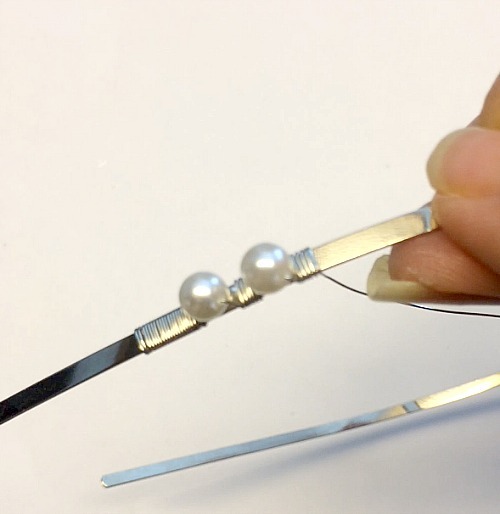 Once the glue is dry, your going to want to start wire wrapping your bigger pearls. Using the 24 gauge wire, start at the bottom of the headband. Leave about 2 inches for your own ear space. Cut about 1 arm length of 24 gauge wire. Start wrapping 11 wraps of wire. After you have wrapped your wire around the bottom a 11 times, start adding your 6mm white pearls. 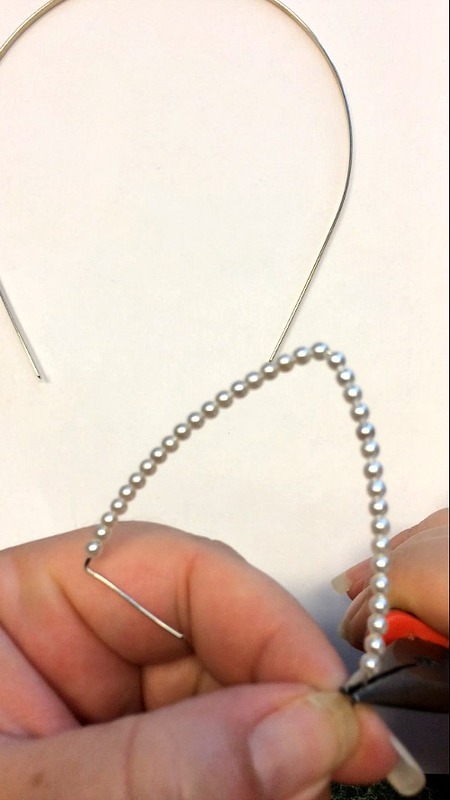 Add one at a time wrapping 5 times between each pearl. Continue wrapping till you get to the other side. Note: When you get to each cat ear peel the glue off as you wire wrap. I take it off as I secure it with the wire. If its not noticeable then you can choose to leave it. 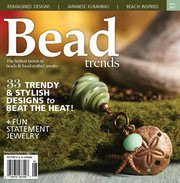 Continue to wire wrap. Make sure you are pulling with some tension, your wraps should be tight like a coil. Once you are finished wrapping all of your 6mm white pearls. 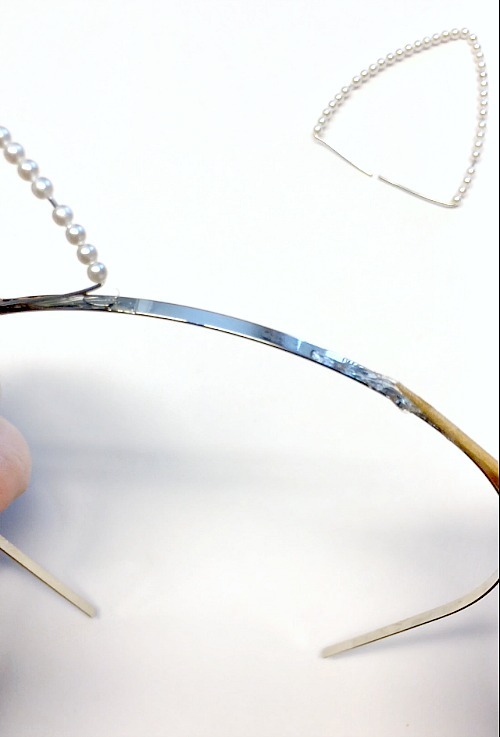 You are going to want to wire wrap like you did in the beginning. Wrap around the bottom 11 times, finishing your piece. Cut the rest of the wire and then tuck in the end with the flat nose pliers. Congratulations! 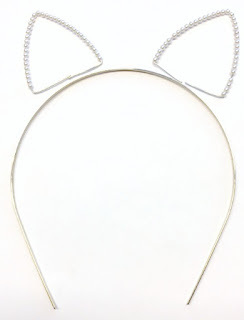 You finished your very own Cat Ear Headband with Jamie Estelle. I hope you had a great time making your headband as much as I loved teaching it to you. If you have any question please feel free to contact me and I will help you any way I can. Enjoy!